Raised in Venice California, I have lived by the ocean all my life. 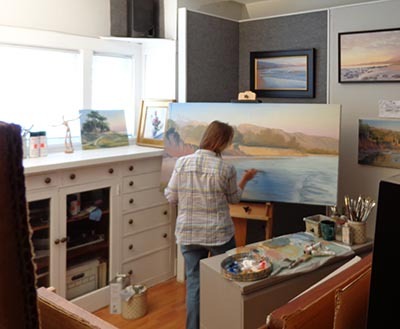 Living by beach I have a deep love for the Pacific Coast, which is expressed in my oil paintings. Through art classes in several colleges I was ables to study art in Europe. In my current series, "Landscapes by the Sea" and"Visions of the California Coast", the focus is on the magnificent landforms and plant life that occur in the unique light and atmosphere of California's coastal areas. The paintings are charged with emotion. In some works the pounding surf, the whipping winds and the rugged cliffs inspire me. These represent the California coast at its wildest. Other pieces show a very peaceful, tranquil view of the seaside. All of my paintings represent an event in a time and place that I experienced and felt the need to express on canvas. 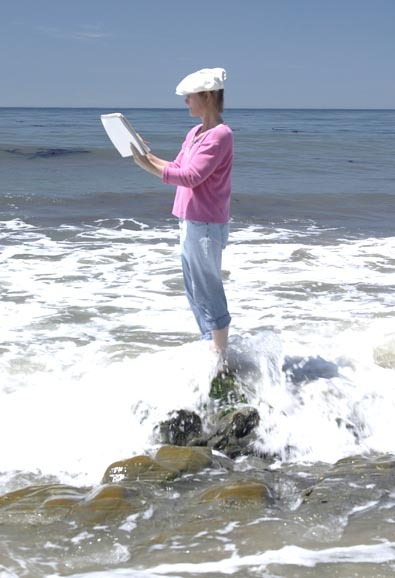 My love of nature, especially the California coastal landscape, is my inspiration. I spend a lot of time out and about looking and sketching. Finding the right location and time of day is key and then to work out a composition that best represents what I'm seeing. Then take all my collected information - photos, sketches and color notes and start the painting in the studio. The actual painting begins with a quick layout of the composition and basic color areas on the canvas. When this first layer or under painting is dry she will begin the many layers that make up the final piece. The finished work will usually have ten to twelve glazed layers of paint. Each of the layers is painted with Gamblin oils. Every layer is allowed to dry before the next is applied to keep the colors rich and vibrant. If oils are painted wet on wet they tend to sink into each other and blend on their own, often dulling the intended coloration. I will refer to the photos that were taken and bring out some of the interesting details of the original scene. The larger paintings take several weeks to complete. I usually have four to six paintings in progress at a time in my studio.